Williams in possession in training yesterday. THE IRELAND TEAM to face France in tonight’s international friendly (8.08pm Irish time) has been announced. 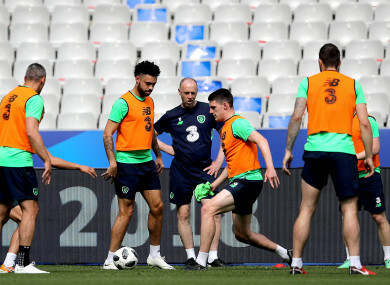 Martin O’Neill’s side take on Les Bleus at the Stade de France and he has gone for a mixture of experience and youth with his starting line-up. Bradford City goalkeeper Colin Doyle earns his third cap behind a back four of skipper Seamus Coleman, Kevin Long, Shane Duffy and Blackburn Rovers defender Derrick Williams, who makes his senior debut. After his man-of-the-match display against Turkey, Declan Rice plays in midfield alongside Preston North End’s Alan Browne. Further forward, Callum O’Dowda, James McClean and Jon Walters get the nod, while Shane Long looks set to lead the line. FRANCE: Steve Mandanda; Djibril Sidibe, Adil Rami, Samuel Umtiti, Benjamin Mendy; Corentin Tolisso, Steven N’Zonzi, Blaise Matuidi; Kylian Mbappe, Olivier Giroud, Nabil Fekir. IRELAND: Colin Doyle; Seamus Coleman (c), Kevin Long, Shane Duffy, Derrick Williams; Alan Browne, Declan Rice, Callum O’Dowda, James McClean Jon Walters; Shane Long. Email “Derrick Williams handed Ireland debut, Declan Rice also starts in Paris ”. Feedback on “Derrick Williams handed Ireland debut, Declan Rice also starts in Paris ”.